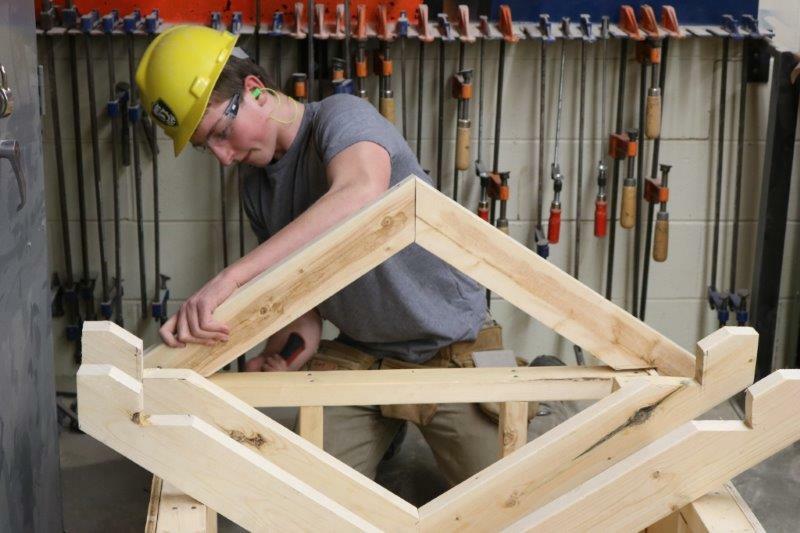 14 students from the KPDSB traveled to Thunder Bay in early April to compete in the Skills Ontario Qualifying Competitions at Confederation College in Thunder Bay. 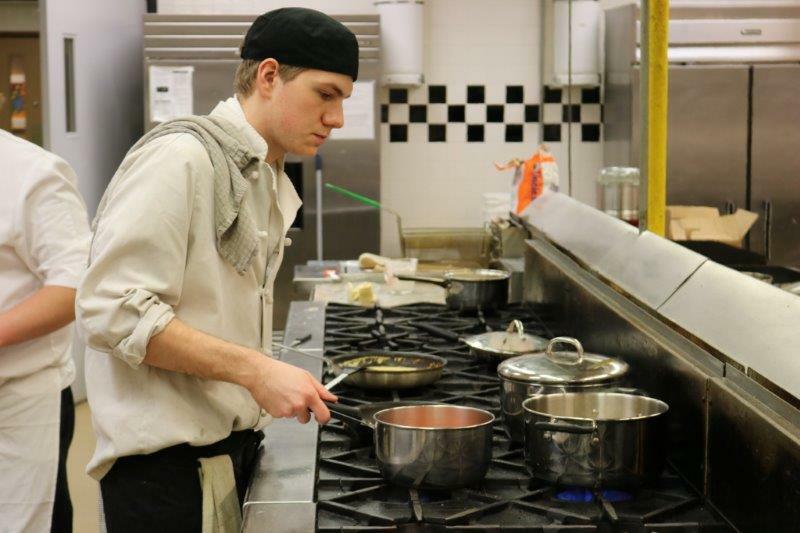 Students from Beaver Brae, Dryden High and Queen Elizabeth represented the KPDSB and their schools by demonstrating their skills in culinary, small engines, carpentry, video production, and welding. It was the largest group of students to date to attend a Skills Ontario qualifier from the KPDSB. 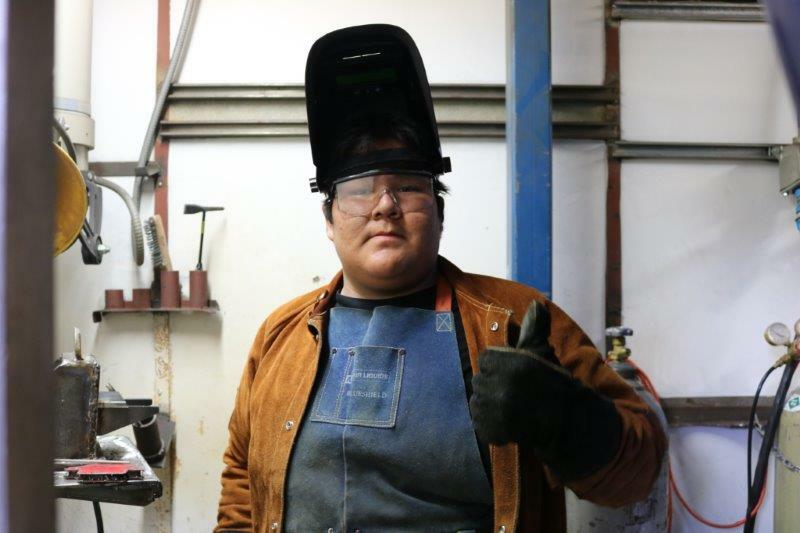 All of our students, while up against tough competition from students across the region, placed in every area of the Skilled Trades qualifier. They each earned themselves a bid to the provincial competition currently underway in Toronto (May 1-3, 2017), where they are facing off against top competitors from across the province. Our students’ participation in Toronto also marks the largest group of qualifying students to ever attend a provincial competition for the KPDSB. Trustees met at Crolancia Public School in Pickle Lake on Tuesday, May 9, for a regular board meeting. The May “Students Come First” presentation titled ‘Kids in the Kitchen and Athletic Education at Crolancia’ was received by Trustees. Staff members Amanda Pedalino and Kayla Blakney, accompanied by Crolancia students, shared some of the ways they are thinking outside the box to deliver athletic and extracurricular activities to their students. One example of this work is the partnership between Crolancia and Ignace Public School to allow both schools to participate in area sports tournaments. Students said being able to participate in different sports has encouraged them to be more active, improved their confidence, and provided opportunities for them to face and overcome challenges. Other examples include an after-school healthy eating cooking class provided through a partnership with the area Northwestern Health Unit where students learn about healthy eating options, safe food preparation and cooking skills. Candice Kerkermeier, Children’s Mental Health Lead, presented the Children’s Mental Health Update. The KPDSB Mental Health and Addictions Strategy for the 2016-2017 school year is guided by three main goals; building organizational mental health and wellbeing, increasing mental health literacy, and changing classroom climate. The work around the strategy is vast, including training for all staff to become a trauma informed and proactive response Board, incorporating student voice through student mental health focus groups, identifying mental health champions in each school and office, conducting staff mental health needs assessments, and resource development to support staff. For more information and access to resources, please visit the recently developed Mental Health section on our website at *|SITE_URL|*pages/view/mental-health. Superintendents Caryl Hron and Joan Kantola presented the KPDSB Administration and Business Report. The following appointments were announced for the 2017-2018 school year. Trustees of the KPDSB are pleased to announce the appointment of Richard Findlay to Superintendent of Business and Chief Financial Officer for the Board, effective July 2017. Findlay began his accounting career with the Kenora Board of Education in 1992 and has since worked in both the private and public sectors throughout Northwestern Ontario. He has held leadership roles in accounting, finance, and business consulting and for the past nine years has owned his own public practice accounting firm in Kenora. Findlay is active in his community, he has been coaching youth sports for nearly two decades, and is currently an elected Director on the Copperfin Credit Union board. Sean Monteith, Director of Education, added “We are pleased to have Richard assume the role as Superintendent of Business for the KPDSB; his experiences in both public and private sectors, as well as his unwavering commitment to kids make this addition to an already strong Senior Administration, a natural fit. As Director I am pleased for the KPDSB, and welcome his innovative thinking to a restructured organization, built for the future, built for kids." Dean Carrie, current Superintendent of Business, will be retiring at the end of the 2016-2017 school year after 30 years with the public school board. It's Time to Register for the KPDSB's Hockey Canada Skills Academies for the 2017-18 School Year! It's time to register for the our popular Hockey Canada Skills Academies in Dryden/Vermilion Bay, Kenora/Sioux Narrows, Sioux Lookout, Red Lake/Ear Falls and Ignace! TIMMINS, ON: Nishnawbe Aski Nation (NAN) and the Keewatin-Patricia District School Board (KPDSB) are pleased to announce the signing of a Memorandum of Understanding (MOU) to enhance educational services and opportunities for students and staff. This historic MOU represents an invested commitment and partnership to support NAN and KPDSB students and staff. 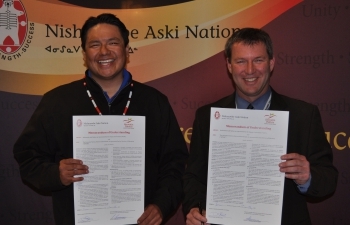 The agreement was signed today in Timmins, Ontario during the NAN Chiefs Spring Assembly. The signing of the MOU is an important step to help NAN students reach their full learning potential, and at opportunities comparable to the general student population in Ontario. Student Support Services – Development and implementation of strategies to support student safety and well-being measures, including mental health, student transition and orientation programs, parent engagement initiatives, support mechanisms for students living away from home, student retention strategies, involvement in extra-curricular activities, and the development of a First Nation student anti-addiction education program. Curriculum – Strategies to enhance the inclusion and integration of First Nation history, culture, perspectives and language within the provincial curriculum as appropriate. Professional Development – Strategies to support staff in meeting the holistic learning needs of First Nation students, development of strategies to facilitate cross-cultural training and professional development for educators in the provincial education system. Communication – Identification of mechanisms to improve communication between provincially funded schools and First Nation schools. Human Resources – Explore options to facilitate increasing the number of First Nation staff, including the participation of elders, in provincial schools. Parental Participation – Strategies to facilitate improved parental communication with, and involvement in, the provincially funded schools their children attend. Nishnawbe Aski Nation (NAN) represents 49 First Nation communities in James Bay Treaty No. 9 and Ontario portions of Treaty No. 5 – an area covering two thirds of the province of Ontario in Canada. 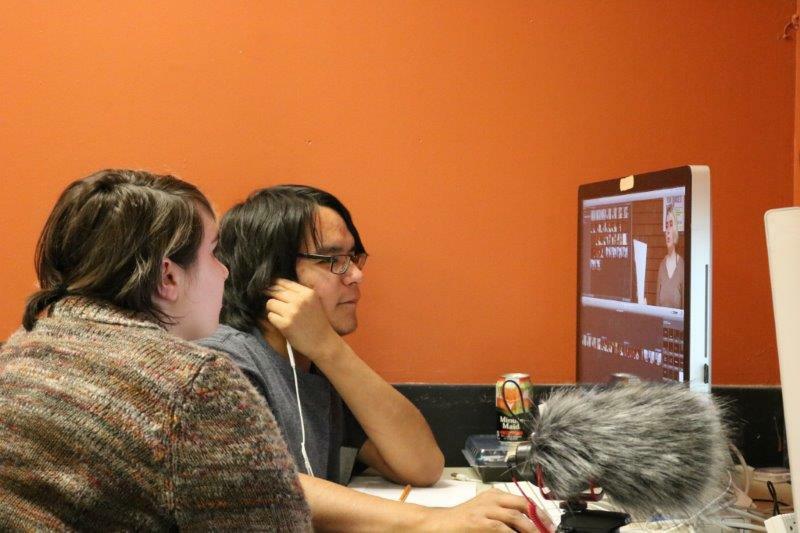 The Keewatin-Patricia District School Board (KPDSB) delivers high-quality educational programming to more than 5000 elementary, secondary and adult education learners across Northwestern Ontario.